There will be a planned sporadic network outage on Tuesday December 22nd from 6:00 PM to 10:00 PM. The Research Databases from off campus. Permanent link to this topic. Posted 2015-12-21 08:58:55. Reply to Lauren_Felder. Categories: Library News. There will be a planned sporadic network outage on Saturday December 12th from 6:00 PM to 8:00 PM. Other websites that will be affected include The Cleveland Memory Project and streaming media provided through Mediasite. Permanent link to this topic. Posted 2015-12-11 07:05:08. Reply to Lauren_Felder. Categories: Library News. 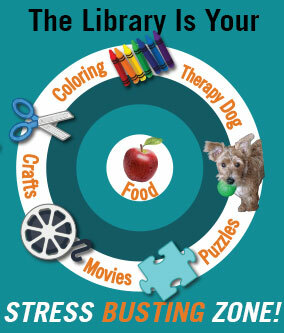 The Library IS Your Stress Busting Zone During Finals Week! We know that Finals Week can be stressful, so in addition to providing study space, research help, and computers, the Michael Schwartz Library is also providing a Stress Busting Zone on the 1st floor in the Library Connection Lounge. All week long, you will be able to play games, color, and do puzzles. On Monday and Tuesday at 2:30 p.m. there will be snacks (while supplies last) to help energize you and get you over the afternoon slump. Derby, the therapy dog, will be here on Monday evening from 8 to 10 p.m. Finally, on Wednesday at 2:30 p.m. you can watch Frozen in the Viewing Room, RT 325. We hope to see you here and good luck on your finals! Permanent link to this topic. Posted 2015-12-01 13:39:27. Reply to Lauren_Felder. Categories: Library News. Showing posts from December 2015 only. Display other dates.